The DAAD Alumni Association of the USA elected its first official board members in 1998 and is now more than 300 sustaining members strong. In our increasingly complex global environment, international study offers life-long benefits of improving communication between people and deepening cultural awareness. Strong individual relations contribute to world peace and stability. The mission of the DAAD Alumni Association is: to strengthen ties between DAAD alumni, both in the United States and abroad; to maintain and expand academic and personal contacts with Germans and German institutions, especially with DAAD Bonn; to expand the knowledge of German culture, past and present, among DAAD alumni and American students; and to encourage US schools to improve German language skills. To achieve these goals, the DAAD Alumni Association awards scholarships enabling American students to study in Germany. Through newsletters, educational workshops, member meetings and trips to Germany, and joint efforts with German-oriented organizations, the Alumni Association seeks to strengthen the relationship between the United States and Germany. 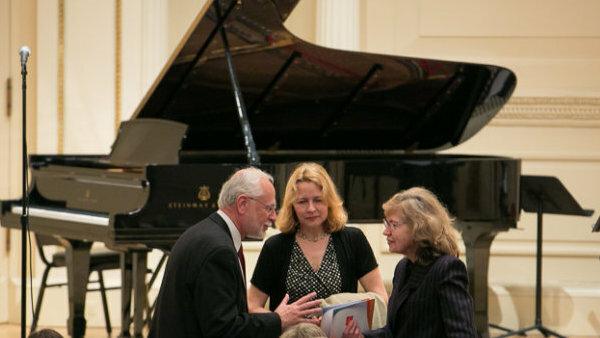 Every year, through the Hubertus Scheibe Memorial Scholarship Fund, the DAAD Alumni Association funds several University Summer Course Grants (in addition to those that the DAAD awards) to qualified young American applicants, including one that is specially earmarked for a student of the fine arts. With generous support from the Arnhold Foundation, the Alumni Association is able to award several RISE Germany Scholarships with a focus on green technology every summer. As of October 2004, the DAAD Alumni Association of the USA had about 300 members and has raised over $50,000. All funds not used for annual administrative expenses remain in a scholarship endowment. Membership growth is an important goal of the Alumni Association. Having been a DAAD grantee in the past, you are eligible for membership and are strongly encouraged to support the above goals so others may enjoy the same kinds of benefits you did during your stay abroad. Contributions will be designated in part for programs and in part for the Hubertus Scheibe Memorial Scholarship Endowment. You may make your membership payment online by credit card using PayPal. Just click on the level at which you want to join the Alumni Association in the box below. Every year the DAAD Alumni Association (DAADAA) supports a number of events and initiatives to support transatlantic exchange. The annual Sound Understanding Concert is one of the DAADAA's most high-profile efforts, but it is by no means the only one. Through newsletters, member meetings, and joint events with other German alumni organizations, the DAADAA seeks to further strengthen the relationship between the US and Germany. If you are donating on the occasion of the Sound Understanding concert, donations of $100 or more will be acknowledged in the concert program. The DAADAA is very grateful for contributions from alumni and other generous supporters that go toward defraying the costs of general operations, including events like the above concert. Click on the button below to support the DAADAA's events & operations using PayPal. As of mid-2016, the Hubertus Scheibe Memorial Scholarship Fund amounted to approximately $95,000. The goal of the DAAD Alumni Association (DAADAA) is to bring the Scheibe fund up to a level where the interest will sustain a certain number of annual scholarships enabling students at American universities to study in Germany. Traditionally, the Alumni Association funds eight to ten scholarships each summer. The Association has also just begun to receive matching grants from certain companies and hopes to expand this in 2016. In broad terms, the annual budget for scholarships in Germany runs just under $25,000 per year. The DAADAA works hard to keep the administrative costs low; all board members are volunteers. The Alumni Association would gratefully welcome any donation of any size to the Scheibe Memorial Fund. Feel free to use the PayPal buttons below to make a donation. Donations can also be made by check in support of either the DAADAA's general events and operations or in support of the scholarship fund. Please make your check payable to "DAAD Alumni Association of the US" and send it to the address below. Board members can be active in any profession, and need not be previous DAAD scholarship holders. They serve for a period of three years, and may be re-elected for one term. The Alumni Association is looking for a diversity of backgrounds and interests, especially with respect to geographical location and age. To nominate yourself or someone else, please contact alumniassociation(at)daad.org. Become a member of DAAD Alumni Association USA! Like our Facebook page and connect with DAAD alumni throughout the United States!